Minibuses are not offered by all vehicle hire companies in Essex & Kent, the main reason being that obtaining insurance for a self drive minibus can often have complications, which tends to be a ‘put off’ to potential minibus hire companies. Minibuses at Allied vary from 9 to 15 seat vehicles and are maintained to the highest standards. At Allied we offer our self drive minibus rental service throughout Essex & Kent – Thurrock, Lakeside, Grays, Tilbury, Dagenham, Dartford, Hornchurch, Essex, Kent, South Ockendon, Swandon, North Fleet, Gillingham, Swanscombe. You may prefer to use our hire vehicle delivery service, which would see your choice of vehicle delivered straight to your door or to whichever location you prefer, given that it is in reasonable distance to one of our branch offices. Typical use of self drive vehicle hire includes holidays, family functions, hen & stag nights, football trips and so on, however we have recently experienced an increase in our vehicles being hired for trips to the European mainland for other similar numerous activities. 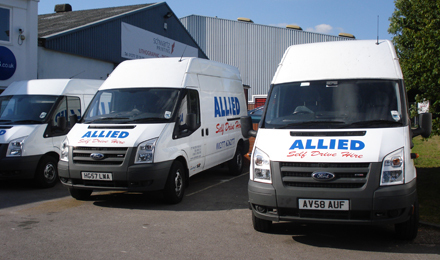 At Allied we also hire out 7.5t trucks which tend to be used for removals and relocations both in the UK and abroad. All of our 7.5t trucks are Euro 4 compliant and can be used in within the Inner London Low Emissions Zone and any similar regulation zones across Europe. When a potential customer contacts us for the European rental option they are immediately informed on all the rules, regulations and information needed to have a problem free and stress journey, as it isn’t uncommon for travelling Brits to encounter time consuming regulation difficulties when travelling abroad. With appropriate knowledge these can be avoided. Do to our success and growing client base we have been able to invest in top of the range vehicles for all your rental needs. We have new, clean, well maintained and good quality trucks such as Mercedes. Hire trucks from Allied have modern digital tachographs and under tail lifts perfect for parcel and other deliveries in Essex & Kent, as well as being a great choice of vehicle for relocations, whether that be in the UK or abroad. They all comply fully with the requirements of the London Emissions Zone (LEZ). Minibus Hire, 7.5t Truck Hire, European Hire, France or Spain, Tail Lift, Relocation, Removals, Deliveries, Vehicle Hire For Family Holidays, Fishing Trips, Corperate Events, Mail Delivery, Digital Tachographs & Tuck-under tail Lifts, Thurrock, Lakeside, Tilbury, Hornchurch, Dagenham, Grays, Dartford, Essex, Kent, Swandon, Northfleet, Gillingham, Gravesend, South Ockendon, Swanscombe.